If you were a pioneer living 150 years ago, you’d probably raise most of what you ate yourself, with the exception of coffee and white sugar and flour. This lifestyle wasn’t easy. A good portion of people’s time and energy went into growing food. Today, we hardly think about where our food comes from. We just know it’s there. Modern food processing factories have made that possible. During the Industrial Revolution of the 1800s, equipment took over many of the jobs humans previously did. These machines changed everything from how our clothing is made to how food is produced. A larger supply of goods could be produced more cheaply. The benefits of the Industrial Revolution soon spread to the food industry as factories began processing food. Farms previously grew a variety of foods; as food processing factories became more common, farmers grew only one or two crops, a practice known as monoculture. Factories, such as a potato processing factory, would spring up in one area. All the farmers in that area grew that crop. Factories today have high-tech machines that can do everything from mixing foods to baking them to packaging them. Humans are still on hand to ensure the products meet a high standard of quality. Factories are inspected by the USDA for cleanliness and safety. Many factories do a good job of producing clean, safe food. Other factories do not. Factories provide work for people living in rural areas where other jobs aren’t available. In some areas, such as Greeley, Colorado, factories are good places for immigrants or refugees to find employment. Factory work is often boring and repetitive. Injuries from equipment sometimes happen. Question: Can I visit a food factory? Answer: Many factories offer tours. 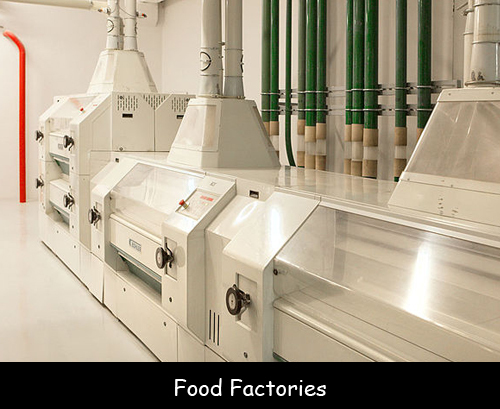 Do an internet search for food factory tours in your area. Take a tour of a sausage factory.